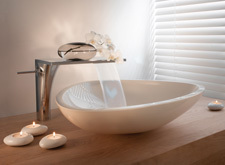 Fallen in love with a mixer, but not sure whether your wash basin will go with it? Would you like to know which mixers from the Hansgrohe and AXOR brands go with which wash basins? Mixer/wash basin combination: we can assist you in your search for the perfect combination. With stylish suggestions – technologically tested at our test center – for Hansgrohe brand products, and with design recommendations for AXOR brand products. Splash test: the bathroom professionals at the Hansgrohe test centre have tested and evaluated lots of different mixer/wash basin combinations for you. We have made the results available to you free of charge. Put together stylish combinations with confidence, without any fear of committing a faux pas. The AXOR brand's design experts have picked out some real dream combinations for you. These combinations go together both visually and functionally. Mixer/wash basin combination: found two that go together beautifully? Once you have made your decision, take your dream combination along to the dealer. Only he is able to assess whether it is possible to meet the spatial and technical requirements on-site. After all, there's no point in having the most beautiful combination if the space restrictions, connections or water pressure are not suitable. All these aspects have to be just right to ensure that installation goes without a hitch.